| lifestyle portraits | mckinzy and her 1st grade book report |. Birchbox teamed up with NYC-based fashion label RUFFIAN to launch their first nail lacquer collection. This is a high gloss nail polish formulated to hold up for days without chipping. The bottle design is super cute and easy to open. I received the color fox hunt a super orange red color great for fall. This shampoo and conditioner is packed with honey pearl powder, rich vitamins and gentle mix of sulfate -free cleaning agents. It is paraban-free, vegan, for all hair types, moisture reviving, enhances volume, adds shine, weightless, UV protection, smoothes hair, seals cuticle, protects color whew!!! And it smells great and in deluxe sample bottles. This CC Cream uses 100% natural ingredients and antioxidant to triple protect UVA, UVB, and infrared -A rays. I have already used it and its not bad. I really like that it protects against these rays. I received a little sample size but it will go a long way. This formula is packed with moisturizing Shea butter and jojoba seed oil to moisturize, plus vitamin, A,C and E to heal cracks and flakiness. I received the color monaco it’s a super bright red but really sheer. I am a little scare of red colors but this is just perfect. On Labor Day weekend we decided to take a ride up to Cave Creek, AZ just to go to the shops and spend an afternoon up there. One of our little spots we like to take the kids up to once in a while. There was this shop that I have seen before every time we go up here. Udder Delight a natural skin care shop with soaps , lotions, scrubs,bath oils, salves but I never had bought anything till this time. I did buy a soap ( Almond Oatmeal Milk and Honey ). My Goodness! this soap is AMAZING it actually works without leaving your skin-tight and dry. I payed $4.99 for a 4 oz bar and it was packaged liked this. I think this soap might be a HOLY GRAIL product !!! I have been trying this soap and I love it!!!!! It leaves your skin super soft even after you dry yourself from the shower your skin will feel soft and smells great. The aroma will last on your skin for so long. Also I have been learning how to make natural and organic soaps and lotion bars so when I saw these I just had to try them. Well I asked Udder Delight for some samples and I received some that I will giveaway and one will receive a full size bar of soap. I did receive some more samples which was Awesome of them but I will also do a giveaway on my YouTube channel for the rest of the samples. The soaps are sample size and lotions come in a 1/4 oz container. So we where able to squeeze a mini getaway with our good and AWESOME friends ( Andrea and Barry ) to our favorite place…………….. Prescott, AZ. Prescott means a lot to us ( Mark and I ). This was the first place Mark took me and we had an amazing time almost 3 years ago and ever since then we have had tradition to go on the guys ( Mark and Barry ) birthday in February. We have been trying to go more than once a year and it’s been working pretty good. Prescott has Amazing views …..lots of trees and mountains compared to the Phoenix Valley. I have lived in the Phoenix Valley for my whole existence and I have never went to Northern Arizona…….. except when I was a Freshman I went to the Grand Canyon for a weekend ……. lots of years ago :). The people are super polite and we have never had an issue with rudeness. We like to go down Whiskey Row and shop at the Antique Stores and of course hit the Row at night till we drop. We stay at a nearby motel and cab it the whole time we are there. We have our tradition of eating breakfast and then shopping and then Whiskey Row and go to as many bars as we can such as The Bird Cage ( now open ) , Hooligans, The Drunken Lass, etc. It’s really nice when they have live bands and they have a variety of music from blues, country, rock and hip-hop. This time we went for a walk around downtown around the shops and the court house had lunch at the Brewery Co. This is our future home….. hopefully soon. Our plan is to own a little shop either thrift or bath and body. Also to get married here, a small evening wedding with lots of light in the woods. Well Prescott we will see you in February 2014 !!! 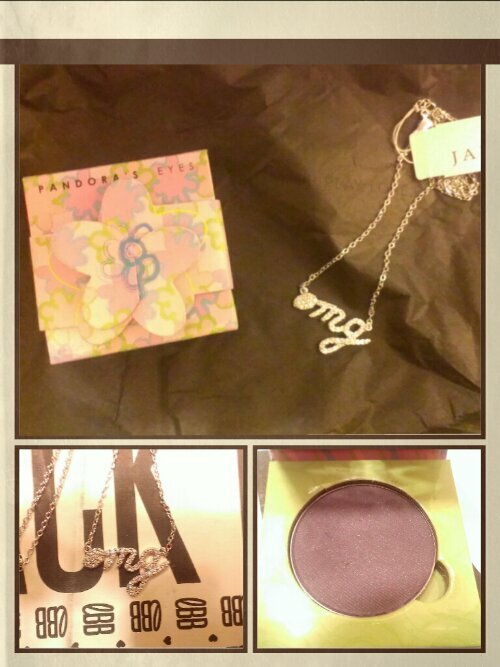 My husband received an offer from Boomerang for 15.00 off your first purchase to LBB. So he subscribe for me for the deal. 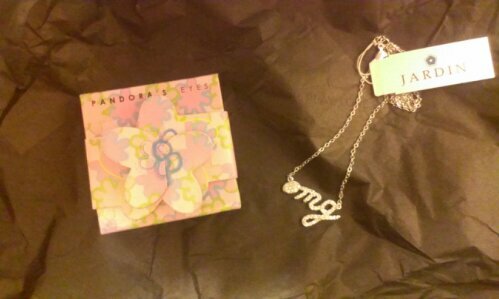 Now I use to be a member months ago for a long time , then it use to be 50.00 dollars monthly and you picked your first item ranging from handbags, beauty, home, accessories, and jewelry. Then LBB would add 2 extra items to your bag and you would start trading with other LBB members. Now they have shoes, clothes and food but I will explain more about it as I continue with my subscription since now I think its so much better and cheaper. Let me show you what I received. I only ended up with 2 items and paid 6.00 dollars total. 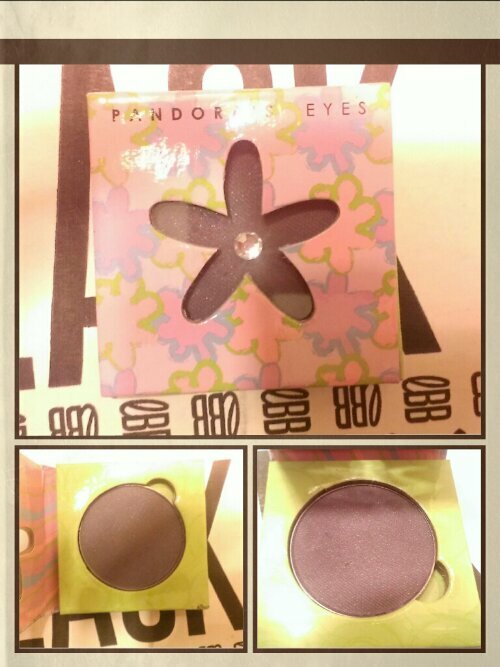 I originally received the Pandora’s Eyes eyeshadow but in a different color, it was a peach color. I ended up with purple haze. The packaging is adorable ( I’m a sucker for packaging). It’s a pretty purple with a hint of sparkle. When you swatch it is very pigmented but when you blend it out its very light. I like it it’s a very subtle color. I wouldn’t mind getting other colors and you are able to remove the pan from the package since it’s magnetic. The original price for this was 18.00 dollars. For my first pick, I had picked a necklace with earrings. The had a little hanger (clothes) and it was very cute and dainty. 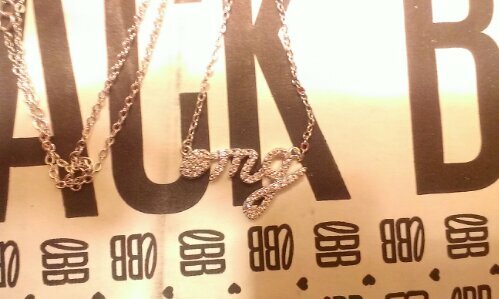 I ended up trading for this omg necklace from JARDIN worth 30 something. I like it its cute and simple. It also has a chain about 18 in. If you are interested let me know I will send you my link to your email since I do get a free item.